I have a bit of an obsession with a good monogram, it's so classic and personal...what's not to love? 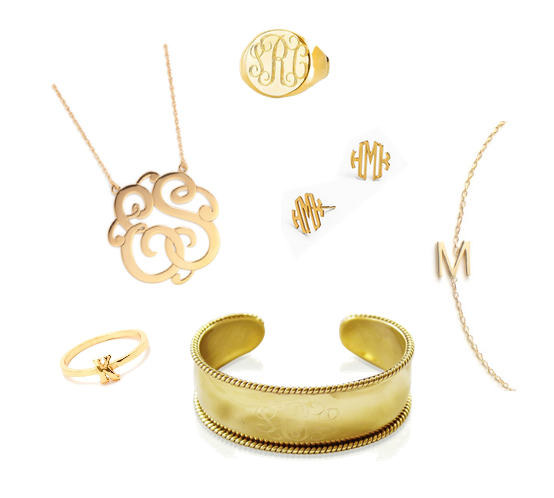 While monogrammed jewelry is definitely trendy right now, it will always be classic. I've long admired my grandmother's timeless gold monogrammed pieces. Special thanks to my mother for considering what my monogram would be while deciding what to name me...genius. I'd love to add some new pieces to my jewelry box, especially this or this. On another note, I figured out how to incorporate the "pin it" hover button on all of my images (no small feat), so pin away! That crosses off another goal on my 101 in 1001!